I've had a most constructive evening! I've finished a couple of dozen tree ornaments, and finished doing a little undemanding knitting. 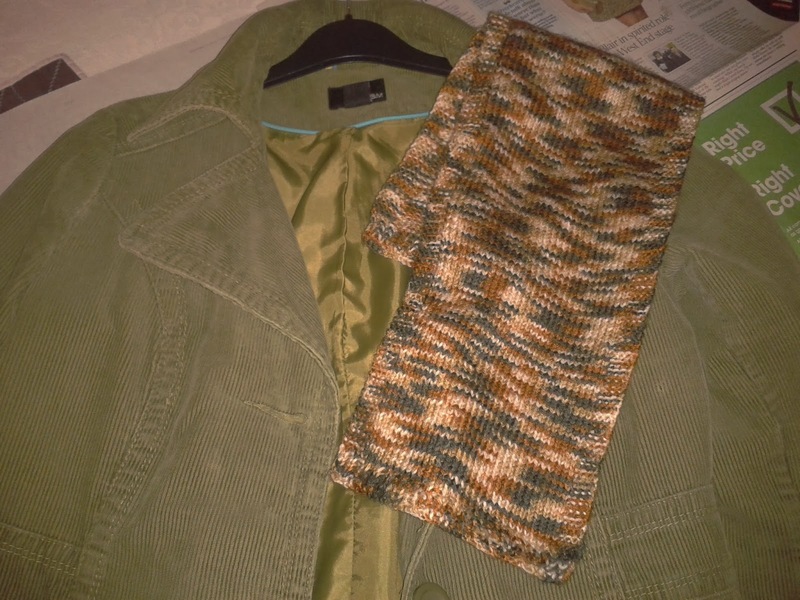 This little scarf goes really well with this new (to me) green corduroy coat, and with weather turning, it'll get used very soon indeed. Like Joanna, I've got away with a fleece up until this week, but now the coats and scarves have to come out. I don't mind, I love to be wrapped up against the cold - and I loved knitting the scarf sat by the fire this evening! So now I'm wrapping things up here, and getting a cup of hot chocolate for supper. 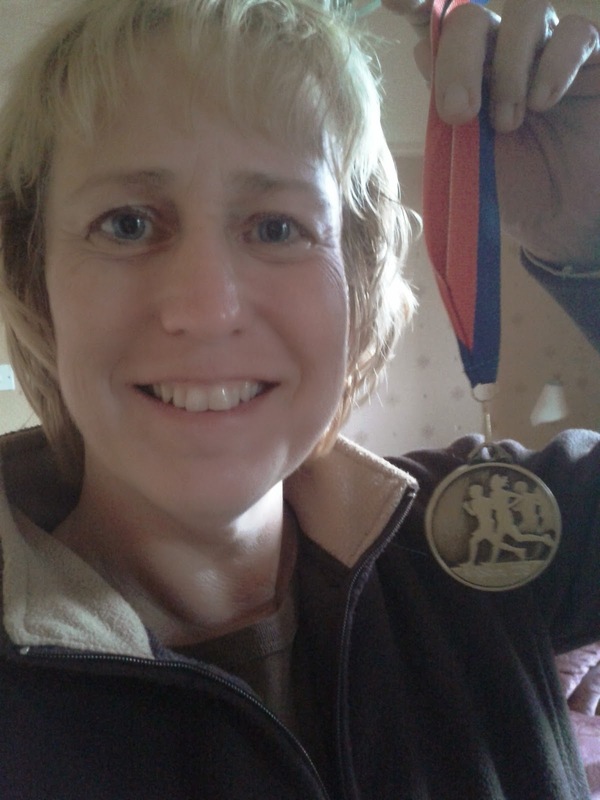 It's been a busy day what with the run this morning too - here's me showing off my runner's medal! Thank you for your company, ladies, I've enjoyed seeing what you've all been getting up to throughout the weekend. Pretty scarf! I'm getting to the party late, but I'm working on some Christmas stitching. Thanks for your great hospitality over the past few months. That's the beauty of the QAL weekend, Sunny - you can drop by when it's convenient! Thanks for playing along this year! You and Joanna have been a lovely pair of hosts this year. WOw, next month it all comes to an end. Can't wait to see all the challenges. Time flies, Sharon! I'm looking forward to the parade next month too. Thanks for your support for the QAL this year. Thank you for hosting a lovely weekend! You and Joanna have been awesome! See you all next month! Why thank you, Lesley! I've enjoyed our weekends too! You've had a very eventful weekend. Time now to take it easy. Thanks, Delores, and I agree about the taking it easy bit - and yet my brother who was in the race with me yesterday was down the gym this morning! Thank you for having us all Hazel. It's been a fun weekend and I love your ornaments and the scarf so it looks like you got loads done too. No worries, Sue - you were all quite well behaved. ;-) All over to your place next month for a grand end of year bash! Nice pic of you and your medal; that's a nice memento of your run. I agree about loving the cold bundling business. It's that cozy time of year. Thank you, Hazel, for being a wonderful host. You make it fun. Thanks for your kind words, Joanna - and I hope you've enjoyed your sessions as much as I've enjoyed mine! Congrats on getting through your run. The pic on the sidebar is - uh - a year or two old. Actually, it was the first one I uploaded to the Hill blog, so it must be seven years old, at least. Eek!